Hi everyone this is mio from Tokyo! Time is passing so fast and can't believe how far away Valentine's day are gone already - Nunzia I think I will try your Recipe when I have the right one to give it to! 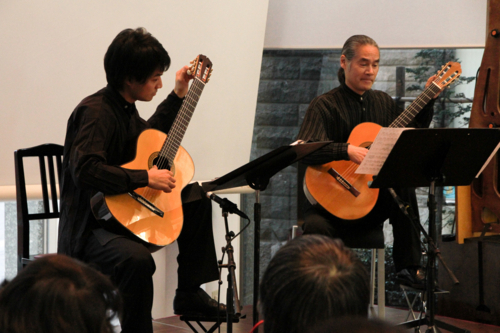 Today I will report about our recent event in Tokyo office - "Talk Session and Mini Live by Two Guitarist Who Have Seen The World"
Guitarist Yasuji Ohagi talks about his experience in Canada tour produced by the Japan Foundation. 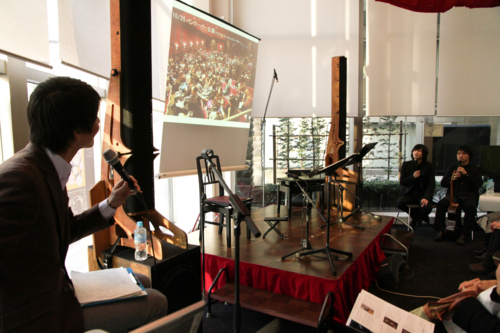 We had three guests: Ohagi san and violinist Kagitomi Gentaro san talked about their Canada tour and gave us mini live. 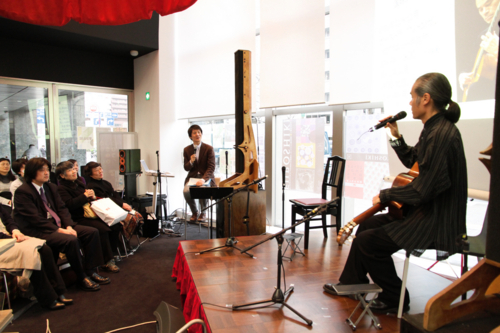 After that, we invited Shomura Kiyosi san as he also experienced touring abroad by JF when he was about the same age as Ohagi san. 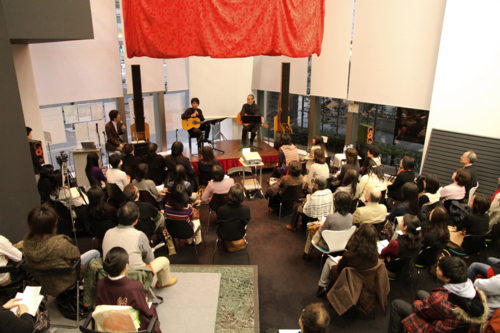 It was first time for us to have event like this in our Library. 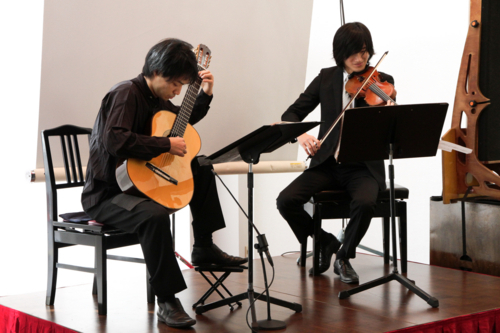 First session- Ohagi san and Kagitomi san played work from Canada tour- the music was filled with so much joy of getting to see each other again and energy for enjoying playing, that I almost forgot that I was on duty! 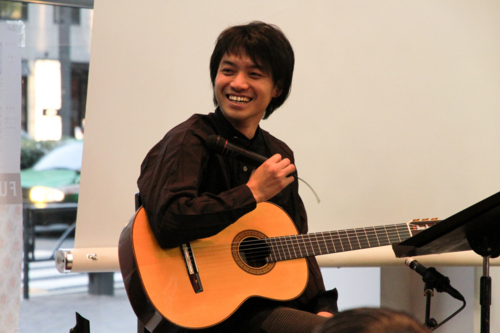 Second session - When Shomura san started playing, the full seat audience became so quiet that you could hear a pin drop (we say "Mizu wo utta youni" literally means "quiet like after sprinkled water in front of the house"). It was really interesting to hear what kind of struggle and joy he had went through when he was in his 30s. 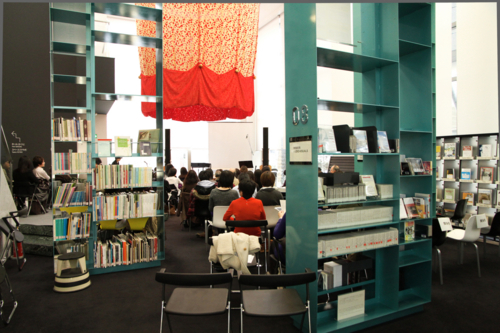 People from the back side saw the stage from between the book shelves. Three musicians talked about how different their sound became after many days of struggle abroad, with different environment and people. It is also the same with us - we struggle to communicate in the new place, with different people, but these experiences strengthen us in many ways and keeps us going and yet again we jump in to the new world. That's all for today, next is Nha san, onegaishimasu!